The second in a series, this DVD helps make your bird’s next visit to the veterinarian stress free! This DVD shows you how to train your parrot to cooperate in his own medical care. Step by step instructions demonstrate how to train each behavior. Positive reinforcement training is a kind and gentle method you can use to teach your parrot to cooperate in his or her own medical care. 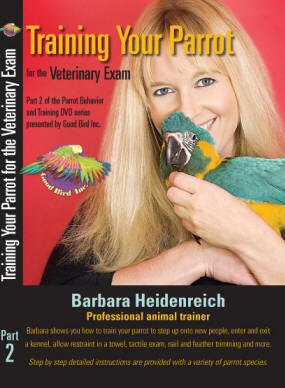 In this DVD, professional animal trainer Barbara Heidenreich shows you how to train your parrot to step onto a scale, step up onto new people, voluntarily enter and exit a kennel, allow restraint in a towel, allow a tactile exam, allow nail trimming and feather trimming, and more. Step-by-step detailed training instructions are provided with a variety of parrot species.